1. Gather your material. 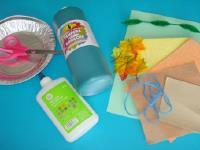 You will need an aluminum pie plate (or other container), green poster paint, white glue, a large piece of construction paper, scissors, yellow, beige, and orange Fun Foam, sandpaper, beige felt, fabric leaves, a green pipe cleaner, and a piece of yarn or string. 2. 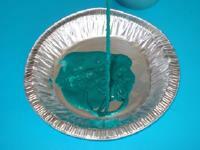 Pour a small quantity of green poster paint in the pie plate. 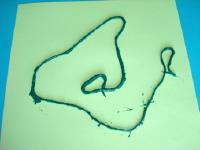 Dip the piece of yarn in the paint and swirl it around until it is completely covered with paint. 3. 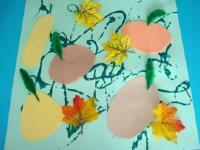 Let the piece of yarn fall on the construction paper any which way to represent creeping stems for your squash. 4. Gently remove the piece of yarn and repeat this operation a few times. You can show children pictures of squash fields to help them understand how squash stems creep in every direction. The goal is to reproduce this on your construction paper. Most children will enjoy this step. However, children who do not appreciate getting their hands dirty may want to wear plastic gloves. Either way, be sure to have wet facecloths handy to wipe paint-covered fingers promptly. 5. 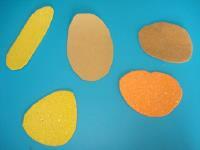 Cut a variety of squash shapes out of the Fun Foam, sandpaper, and felt. 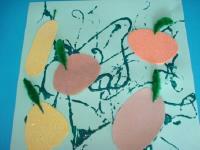 Again, show children pictures of different types of squash to inspire them. 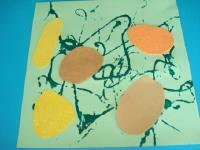 With younger children, simple round or oval shapes will work just fine! 6. Glue the squash all over your squash field. 7. Cut the green pipe cleaner into pieces and stick each one on the tip of a squash to represent peduncles. 8. Finally, glue a few fabric leaves here and there to complete your project. 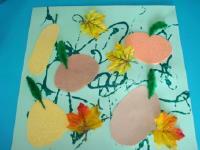 Display children's artwork in a row to create a gigantic squash field.